Advantages: High quality decals in perfect register; full colour instructions with reference photos; fascinating markings. Xtradecal continues to produce excellent quality decals, in particular for RAF aircraft subjects, and once again they have not let us down. 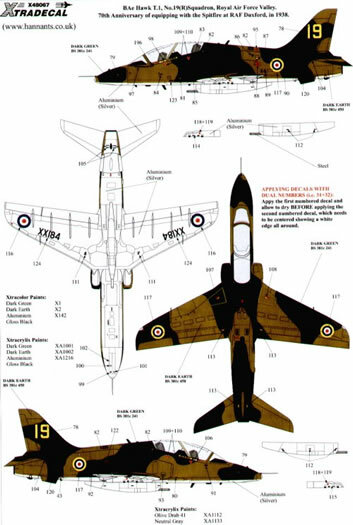 Xtradecal has produced yet another fine quality decal sheet depicting the two BAE Hawk display aircraft schemes for aircraft based at RAF Valley. 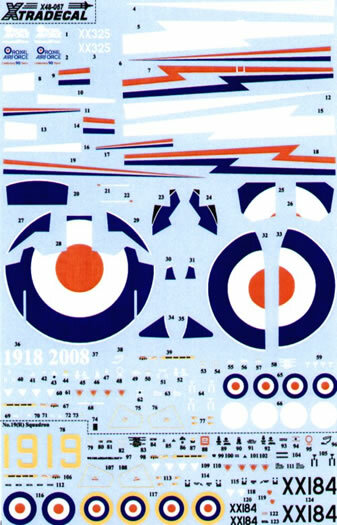 The decals are recommended for the 1/48 scale Airfix kit. The decals are superbly printed and they have good colour saturation and are in perfect register. As usual with Xtradecals, the carrier film is ultra thin and my experience with their decals has been that the decals have to be handled carefully and will snuggle down into the surface detail well. The carrier film then almost totally disappears under a coat of clear. BAE Hawk T.1 XX325 of No 208 Sqn based at RAF Valley in the display colour scheme for 2008. This aircraft is finished in Overall Gloss Black. A large Red, White and Blue lightening flash runs along the fuselage from the nose to tail. 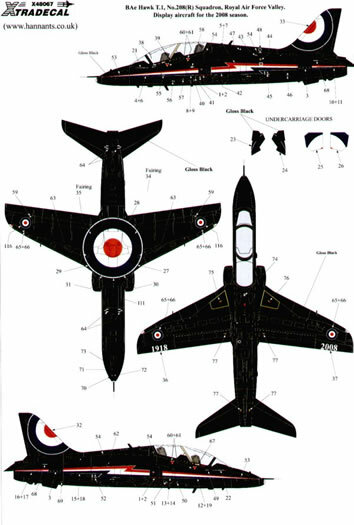 A large RAF roundel is painted on the tail fin and the underside fuselage. BAE Hawk T.1 XX184 of No 19(R) Sqn based at RAF Valley in 2008. This aircraft is finished in a scheme depicting the 70th anniversary of equipping with the Spitfire at RAF Duxford in 1938. The aircraft is finished in the early Spitfire scheme of BS381C:241 Dark Green and BS382C: 450 Dark Earth upper surfaces and Aluminium under surfaces. The roundels are a small version of the yellow, blue red and white 1938 version and a yellow 19 is painted on the tail.